A new 5-channel CAN-USB interface with CAN FD support - MACH SYSTEMS s.r.o. Kvaser AB, a leading CAN tool supplier from Sweden, unveils their second interface with CAN FD (CAN with Flexible Data-Rate) protocol support. Kvaser USBcan Pro 5x HS is a 5-channel CAN-USB interface with user scripting feature. Each channel has galvanic isolation. The device provides user scripting in Kvaser T language (based on C language). Scripts run directly on the device and there is no need to be connected to the computer since the device can be stand-alone. 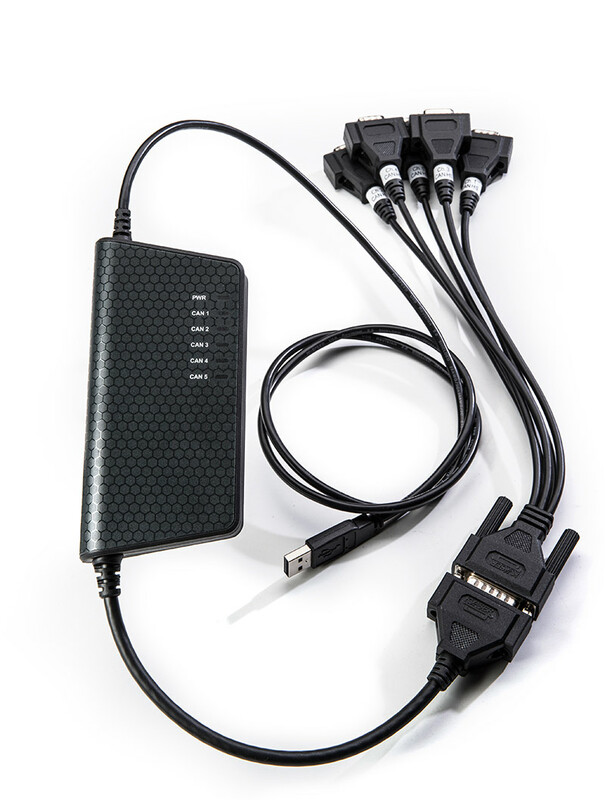 The interface can therefore act as a regular CAN-USB interface with 5 channels, and also as an independent embedded tool with runs custom user’s applications and scripts. Further information available on product page. The first interface with CAN FD support was Kvaser Memorator Professional 5xHS, which we presented earlier. The Memorator, apart from user scripting capability, also provides CAN communication logging onto SD/SDHC card.